Peace Corps Online: May 26, 2005: Headlines: COS - Belize: Computers: San Pedro Sun: Peace Corps Volunteers Rick and Stephanie Dalton announced the first graduating class of their "Children's Computer Course." May 26, 2005: Headlines: COS - Belize: Computers: San Pedro Sun: Peace Corps Volunteers Rick and Stephanie Dalton announced the first graduating class of their "Children's Computer Course." Peace Corps Online: Directory: Belize: Peace Corps Belize : The Peace Corps in Belize: May 26, 2005: Headlines: COS - Belize: Computers: San Pedro Sun: Peace Corps Volunteers Rick and Stephanie Dalton announced the first graduating class of their "Children's Computer Course." Peace Corps Volunteers Rick and Stephanie Dalton announced the first graduating class of their "Children's Computer Course." 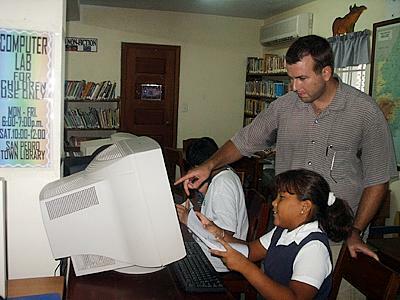 The San Pedro Town Library, with the assistance of the Ambergris Caye Chamber of Commerce and the donation of computers by Captain Morgan's Retreat, announced the first graduating class of their "Children's Computer Course." 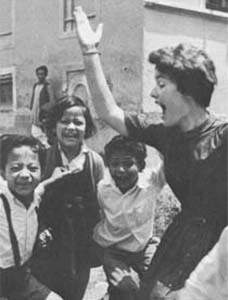 Students involved, completed one hour of classes per week for a period of six weeks. The classes included basic computer skills and an introduction to Microsoft Word. Peace Corps Volunteers Rick and Stephanie Dalton, with the assistance of Steven Demaio, taught the course from CocoNets Internet Café on Barrier Reef Drive. The following students received a Certificate of Completion on Thursday, May 19th, 2005: Sucely Blanco, Elaila Castillo, Ricky Marin, Michelle Paz, Jasmine Rodriguez, Karina Rodriguez, Roxette Santos, Roberto Toriz and Giselle Zetina, Maverick Aguilar, Ivy Alamilla, Eleena Ayuso, Ricky Luna, Stefan Solorzano and Edwardo Vasquez. In addition to the certificate, each student received 10 free hours of internet usage at CocoNets Internet Café donated by Steven Demaio and a book from the library. The Children's Computer Course is open to students aged 10-12 that have been library members in good standing for at least one month. A nominal fee is charged for the course and the next course will begin on Wednesday, June 1st. Parents and guardians are reminded that the deadline for registration and the payment of fees should be made at the library before the classes are scheduled to begin. The library is currently trying to acquire internet access for the computers so that it can be introduced during this course. Congratulations to our first two classes and thank you for participating!